That has to be the album title of the year. 2009 was a good year for the Flaming Lips. After not releasing any albums since 2006, the Flaming Lips issued two albums last year: Embryonic and a collaborative remake of Pink Floyd’s 1973 album Dark Side of the Moon. Before I get started, I have to mention that I have always held Dark Side of the Moon up as one of very few perfect rock records, along with Guns ‘N Roses’ Appetite for Destruction and Nirvana’s Nevermind. Embryonic was a very solid album, but this track-for-track version of Dark Side of the Moon is not perfect, but it is very special, and there is no mistaking it for a Flaming Lips album. This is not another Beetlemania. You probably figured this out from the title, but there is a little more than the Flaming Lips on this album. They recruited my hero, Henry Rollins, Wayne Coyne’s (the Lips vocalist and all-around musician) nephew’s band Stardeath and the White Dwarfs. And for good measure, Peaches stepped into Clare Torry’s shoes to sing the aria on “The Great Gig In The Sky”, and did an unbelievable job. I got gooesbumps the first time I heard her. Her level of emotion is intense. I put on my best headphones and gave this album another listen today. My god, what a cool album. This is not a warmed-over Matchbox 20-style tribute. It is a rich album that the Lips (and their friends and relations) left their mark all over. It is more frenetic, psychedelic and fuzzy than the Pink Floyd version, but just as slickly crafted as the original. I never would have thought that anyone would be able to re-do this album as well as these collaborating artists. The overall feel of the album is sort of an industrial techno-pop. It starts out with “Speak To Me/Breathe” with some creepy spoken word by rock’s thinking man, Henry Rollins, which was pretty damned far-out, in a heavy sort of 60’s way. From then on, the songs are pretty unrecognizable from their original form until my favorite song of the album — “The Great Gig In The Sky” where Peaches got her shot at it. This song is where I could most readily tie together the original and this new version. “Eclipse” rocked traditionally in a late-60’s kind of way, and was probably the only track on the album that sounded like it could possibly be included into a Flaming Lips live show. As I said earlier, it is not perfect. There were a few parts of the album that nearly drove me to the brink of insanity, including the definitely bizarre re-do of “Money” and the intro to “Time/Breathe (reprise)”. Christ almighty, enough already. Maybe I am just too dumb to appreciate what they did. Despite this nasty criticism, this version of Dark Side of the Moon is definitely worth your time, and may give you new eyes to look at the original source material. Go ahead and buy it. 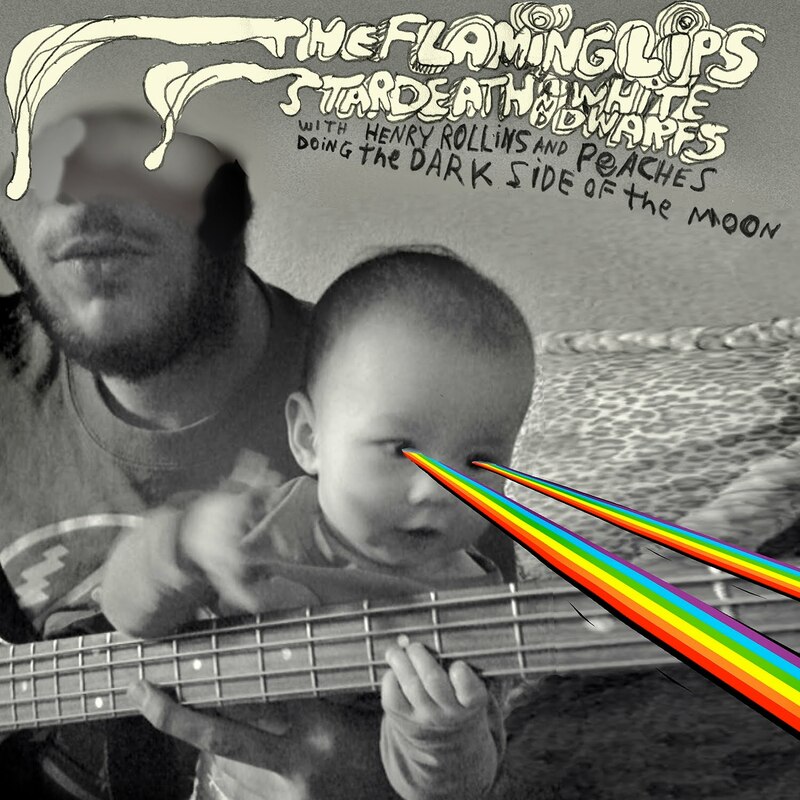 The Flaming Lips and Stardeath and White Dwarfs with Henry Rollins and Peaches Doing The Dark Side of the Moon was released via iTunes on December 22 of last year. If you crave something more special, and are a dedicated Flaming Lips fan, on April 17, Warner Brothers released 5000 copies of the album on 12" clear or green vinyl along with a CD copy of the album included. There are still a few around if you really need it bad. Maybe next we can get Tool to cover The Wall.